We've been together for so long. I first met you when I was pregnant with my first child and now, almost six years later, my subscription has never lapsed. You make it so easy with your Super! Deals! that give me three years of you for an irresistible price. I'm sorry to say that I might be breaking up with you. Before you start trying to entice me by throwing in a free year of Family Circle, hear me out. First, I realized recently that most of my parental paranoia has come from your "It Happened To Me" articles. (In fairness, it's either you or the What to Expect series but I'll deal with them later.) When my daughter was very young and you ran the story of the baby who got a hair wrapped around her toe and it almost had to be amputated, I didn't let my daughter on the floor for a month without vacuuming first and then running a lint brush over the carpet. This month's story about the baby's car seat not getting strapped back in after a trip to the car wash was almost too much. I could just skip that section, of course. But, there would always be articles lurking in the shadows telling me the next big thing that will either make my child a real live Baby Einstein or send him straight to Preschool Drop-Out. I've also noticed recently that there is an abundance of thick, several page long ads scattered throughout your magazine. I understand that you have to pay the bills, what with the SUPER! DEALS! I'm getting and all that but these things annoy me and make it difficult to flip through the magazine to find the article I need to show my pediatrician husband about how we can save our child's life through better housekeeping. Also? This is taking things a bit too far, don't you think? I mean, seriously. 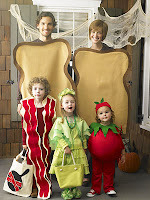 Dressing my family up like a BLT? Besides, no matter how cute clever ridiculous this costume is, I am one kid short of a BLT. So, Parents, you're on notice. Now that my kids are older, I can stop obsessing over the "It Happened To Me" section and I can have another kid to add the tomato to my BLT but if you don't do something about the insane amount of ads in your magazine, I just might have to cut out early on my 42 year subscription.